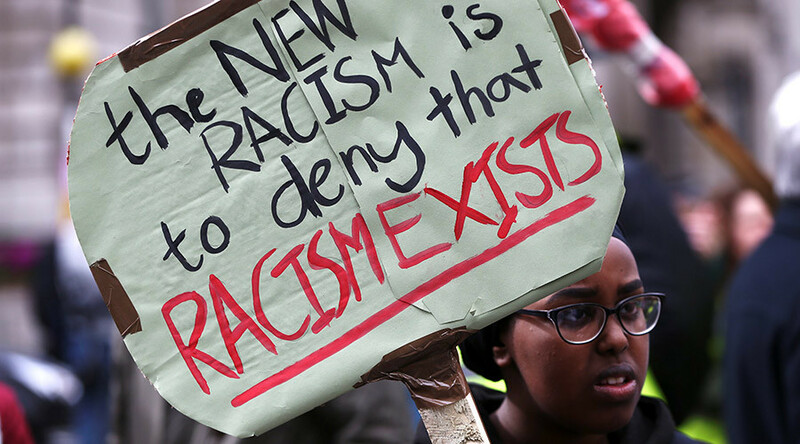 Around 30,000 people took to the streets of London on Saturday to protest the rise of racism, Brexit, the government’s proposed immigration policies, and US President Donald Trump, ahead of International Day for the Elimination of Racial Discrimination. The procession started in front of the BBC Broadcasting House in Portland Place, and then continued on towards Parliament Square, where a demonstration was held. Protesters carried placards reading “Stand up to racism,” “Migrants and refugees are welcome here,” “No to racism,” “Stand up to Trump,” and others. The presidency of Donald Trump and Brexit were among the focal points of the event, as protesters expressed support for migrants and refugees, condemning allegedly “racist” policies of the US president and UK Prime Minister Theresa May. “We’ve had the election of Donald Trump, with his Muslim ban and the wall with Mexico. 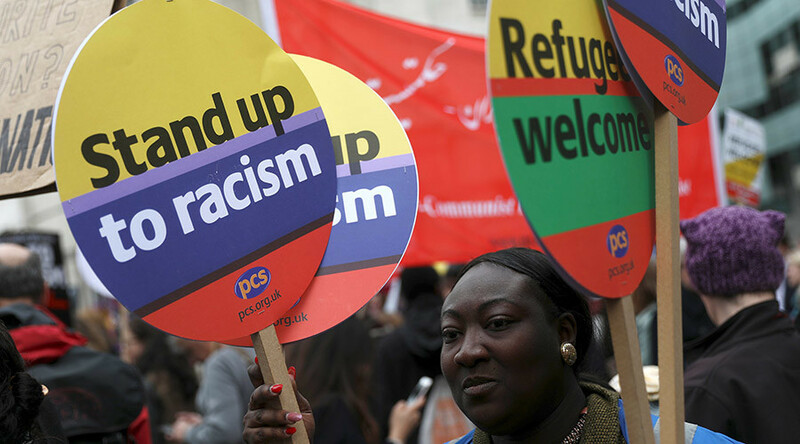 We’ve had the EU referendum, where we’ve seen the highest increase in reported hate crime in the country, showing that the scapegoating of migrants gave confidence to racists,” Zakariya Cochrane, assistant convener for Stand Up to Racism, said as cited by the Independent. Some protesters compared Trump to Hitler, as placards showing the president sporting the distinctive mustache could be seen at the event. Donald Trump has been repeatedly accused of being “racist” or “right-wing” – allegations he firmly rejects. Former Guantanamo Bay prisoner Moazzam Begg, while delivering a speech at Parliament Square, called Trump a “bad dude,” eligible for a stay in the infamous facility. “The rise of the far right and the Nazis and fascists has seen a new wave with the election of Donald Trump, who said when he came to power, ‘I’m going to load up Guantanamo with some bad dudes,’” Begg said. 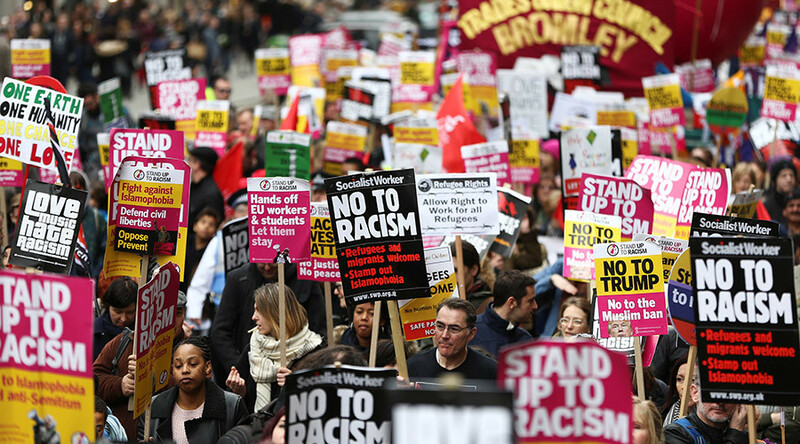 While protesters were seemingly quite unanimous in their attitude towards Trump, their views on the correlation between Brexit and racism differed. Far-left Spartacist League activists actually praised Brexit for escaping the “racist fortress of Europe,” while demanding full citizenship and rights for migrants. The majority of protesters, however, condemned both Brexit and the proposed strict immigration policies. Around 15 far-right activists crossed the path of the march at Piccadilly Circus with ‘England First’ placards, but police pushed them back, with no further incidents reported.